DURHAM, North Carolina (WTVD) -- Duke ended Grayson Allen's indefinite suspension just in time to give coach Mike Krzyzewski a proper sendoff. Allen had 15 points and seven assists in his return from a one-game ban for tripping an opponent, and No. 8 Duke routed Georgia Tech 110-57 on Wednesday night in Krzyzewski's final game before leaving the team to have back surgery. It's been a week full of surprises at Duke, where the announcement of Coach K's imminent, if temporary, departure was rivaled by the abrupt end of Allen's suspension - a move Krzyzewski said was "appropriate" after discussions with athletic director Kevin White. 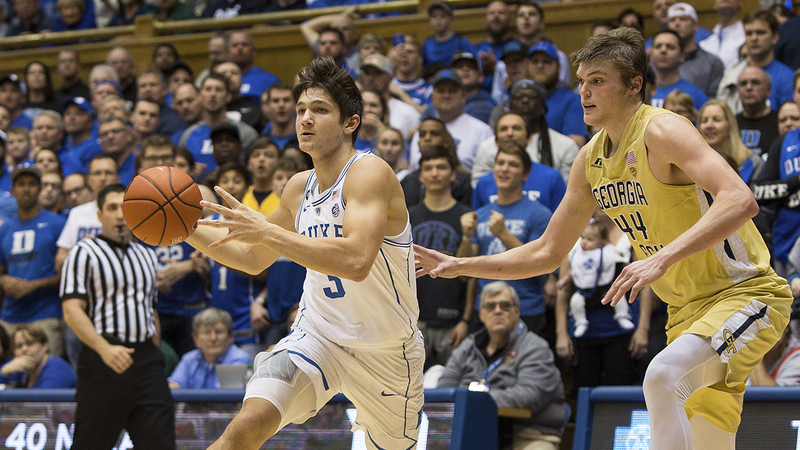 "(Krzyzewski) ultimately felt that I was ready to come back, and I felt good coming back," Allen said. "And so I accept all the discipline that came my way, and I know that it was my fault." Mike Kryzyzewski speaks to the media after his final game as coach before back surgery. Still, it was largely overshadowed by a pair of subplots: Allen's quick return from what was an indefinite suspension for tripping an Elon player Dec. 21, and Krzyzewski's upcoming leave of absence that's expected to last a few weeks. "We're writing kind of our own story, but it's kind of a weird story right now," guard Luke Kennard said. Krzyzewski will have surgery Friday to remove a fragment of a herniated disk from his lower back, and at times his discomfort seemed apparent: The soon-to-be 70-year-old appeared to hobble on his left leg, at times leaning back on the bench with that leg extended and clutching it. He said it's been bothering him for roughly a month. "The biggest thing for me ... is how tired you get because of pain," Krzyzewski said. "Even tonight, you're just in pain all the time. You just want to punch it, but then you're punching yourself. I'm ready to have this taken care of." In his goodbye-for-now game, they finally looked like the nation's preseason No. 1 team. Duke took control with an early 29-7 run, needed about 10 minutes to build a 20-point lead and scored a season-best 61 points in the first half - only two fewer than rival North Carolina scored on the Yellow Jackets in an entire game. "I don't know who would have beaten them tonight," Georgia Tech coach Josh Pastner said. The Yellow Jackets, who were coming off a 75-63 win over then-No. 9 North Carolina on Saturday, couldn't make it two in a row against the Tobacco Road powerhouses. They allowed 11 3s in the first half after previously not giving up more than that in any game. With Allen back and serving as the primary facilitator, the Blue Devils seemed more willing to make the extra pass. Duke finished with a season-high 24 assists - 12 during that dominant first half - after having just eight without Allen in an 89-75 loss at Virginia Tech four days earlier. Capel's first game of the season in charge of the Blue Devils comes Saturday when Boston College visits. After that: Road games at No. 12 Florida State and No. 9 Louisville - Allen was caught tripping players from both teams in Durham last season.